Here are some quick links to articles on this page. Please note that most of these archives has significant photographs involved and may time a little time to load. Please have patience - it's worth it! Thanks to Erica for putting it together! Check out some Volunteer Project slideshows and videos Here! Thanks to Dave, Bruce and Lise for all of their image work! Check out the images of the Rosewall Restoration Project! 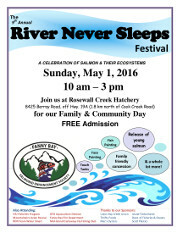 The River Never Sleeps Festival 2016 - was held MAY 1st! 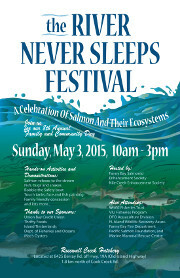 The River Never Sleeps Festival 2015 - was held MAY 3rd! The River Never Sleeps Festival 2014 - was held MAY 4th! 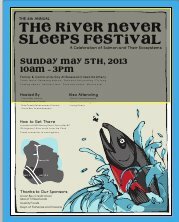 The River Never Sleeps Festival 2013 - was held MAY 5th! 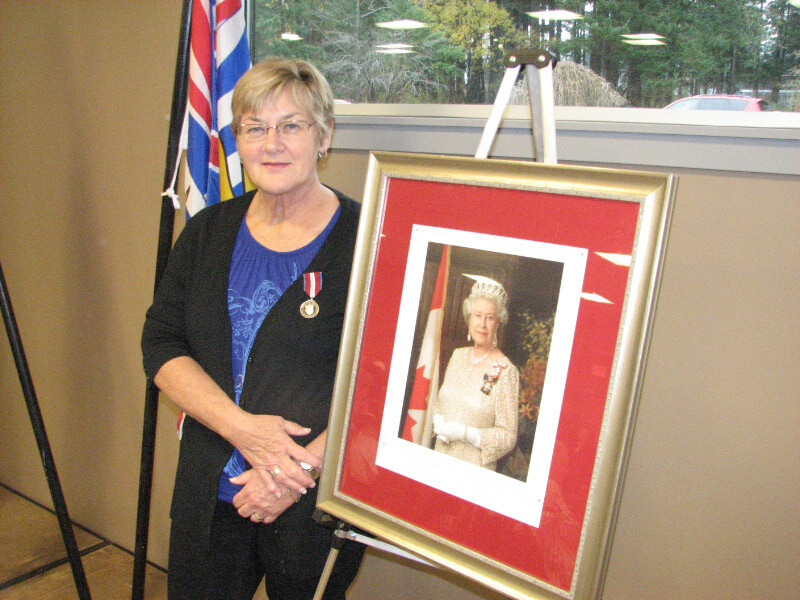 The Fanny Bay Salmonid Enhancement Society (FBSES) is pleased to announce that Judy Ackinclose is the recipient of the Diamond Jubilee Medal. Judy was nominated by FBSES for her commitment to supporting the conservation, education and protection of salmon resources in British Columbia. Check out the great activity of our 2012 Wilfred Creek clean up and Bar-be-que HERE. The River Never Sleeps Festival 2012 - was MAY 6th 2012. 453 people came out to explore the vibrant life of our living rivers. To see images of our festival please go HERE! 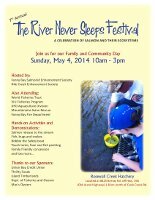 The 2011 River Never Sleeps Festival (Poster) was held Sunday May 15, RAIN OR SHINE! Click for Photos of the 2011 festival. The 2010 River Never Sleeps Festival :Click for Photos of the 2010 festival. John and Helen Bradbury's "Retirement" Party. The 2009 Christmas Party :Click for Photos . The 2009 River Never Sleeps Festival :Click for Photos of the 2009 festival. The Quinsam "Pink Eggs" Crew. April 12: A very successful Young streamkeepers course (pictures). April 26: Farewell to our Chum! Good luck guys! 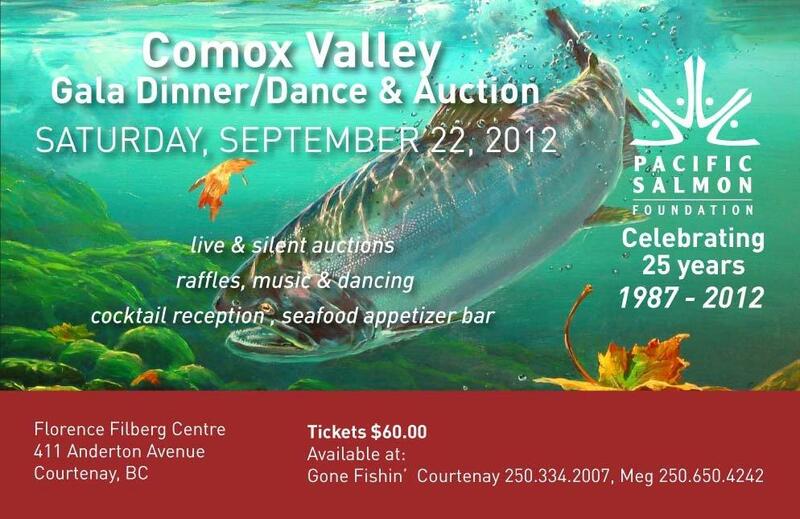 © Fanny Bay Salmonid Enhancement Society, 2011.